Confetti squares are one of those amazing retro desserts that are completely delicious, completely insane, and way too easy to make. 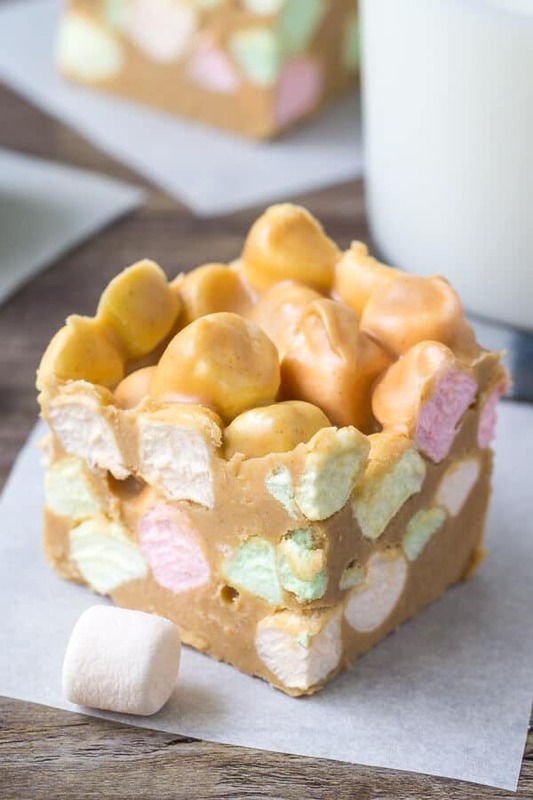 They’re also known as peanut butter marshmallow squares or butterscotch marshmallow squares – and they’re basically a fluffy cloud of sweet peanut butter deliciousness. Warning – these are not for people without a serious sweet tooth. The recipe is so simple that I’m almost embarrassed to be sharing it here on Just So Tasty. However, like so many desserts that our grandmothers made – they go out of style and get lost. 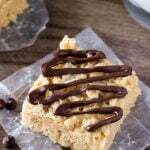 To make confetti squares the recipe is super simple and there are only 4 ingredients. 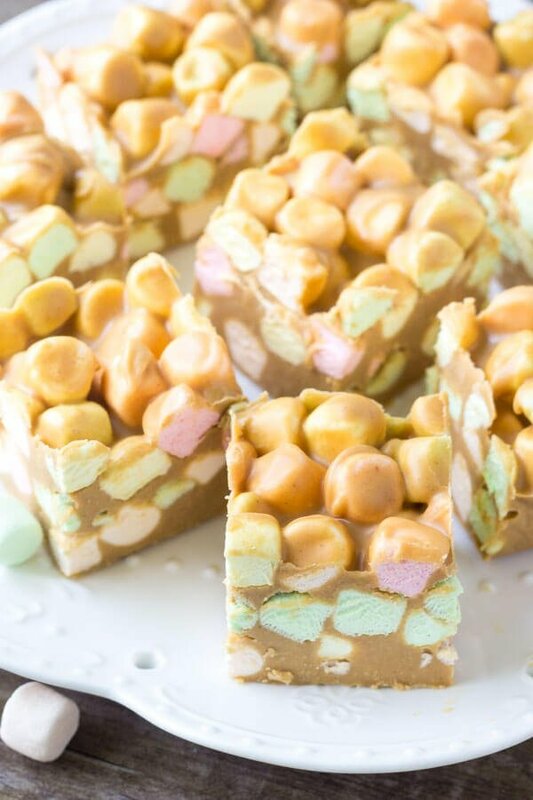 You could obviously use regular marshmallows, but the rainbow variety are what give confetti squares their name. Plus – seeing a bag of multicolored marshmallows makes me nostalgic in the best possible way. And nostalgia makes me happy. Almost as much as peanut butter marshmallow squares. The flavor in these bars is similar to scotcheroos (hence why they’re sometimes called peanut butter marshmallow squares or butterscotch marshmallow squares), but they’re soft and chewy instead of crunchy. Then the marshmallows make them even sweeter. 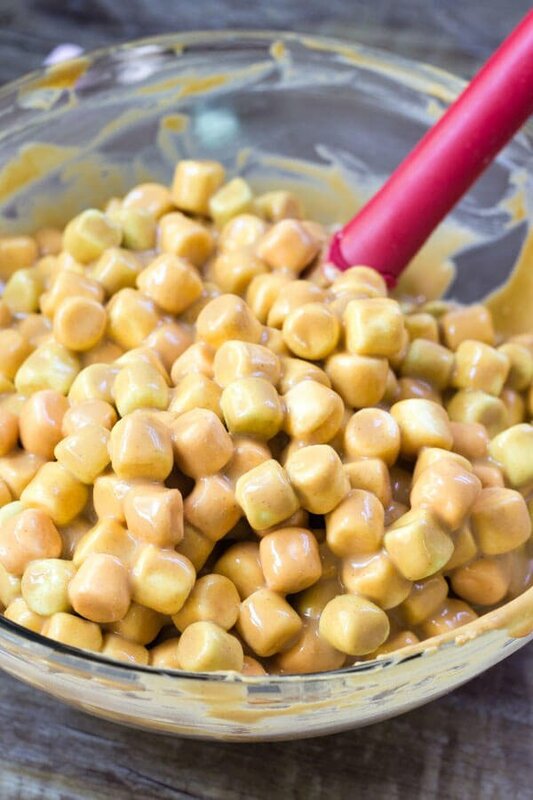 To make confetti squares we melt together the butter, peanut butter, and butterscotch chips over low heat in a saucepan. You’ll want to go slowly here so it melts into a smooth and creamy sauce without any lumps. Then remove from the heat and allow the mixture to cool. 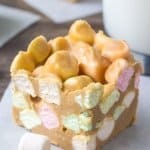 This is absolutely necessary, otherwise if you mix in the marshmallows while the peanut butter is still hot you’ll melt the marshmallows and end up with a big sticky mess. After the marshmallows are stirred in, the batter is spooned into our prepared pan, and we chill in the fridge to let the bars harden. 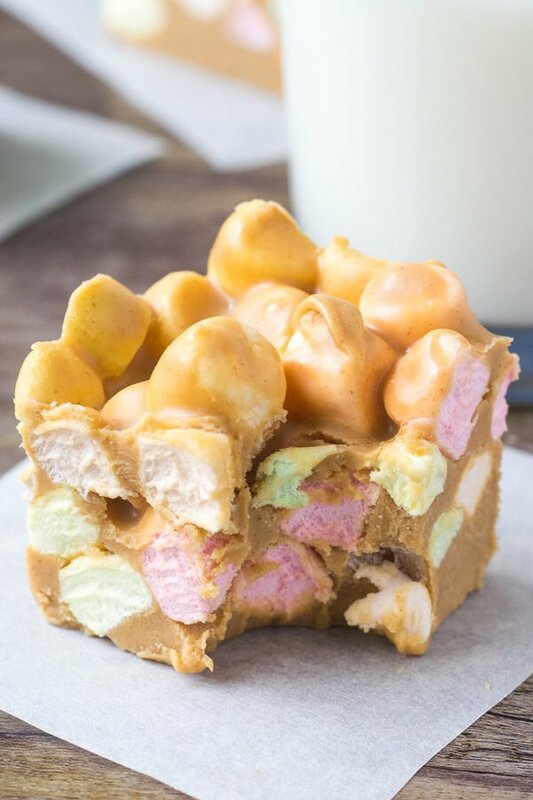 Sweet, peanut butter butterscotch marshmallow perfection. If you remember confetti squares from your childhood – then you know how delicious these are! And if you’ve never tried confetti squares before, then you definitely need to try this super easy no bake recipe! For this recipe, it’ll be fine! Yup – then thaw in the fridge! I’ve made these before and love them. But I can’t remember: are these ok to stay out of the fridge for an afternoon or do they get really soft/mushy? From many past experiences, I NEVER melt the butterscotch chips on the stove! Not sure what ALL the ingredients are in butterscotch chips but besides the sugar, there’s something else in them that cause them to burn at the bottom of the pot before they actually melt. I put the butterscotch chips with a tablespoon of butter in the microwave on 50% power and 10 seconds at a time til melted . Then I add them into the peanut butter and butter mixture that’s been melted together in the pot. No burnt or lumpy butterscotch chips thank heaven! Could I scoop these into cupcake liners instead of a pan? Would I need to spray the liners?